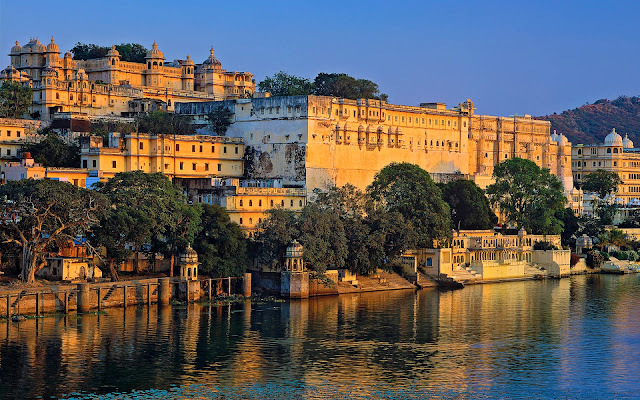 City Palace in Udaipur is one of the biggest and the largest palaces in Rajasthan state. In this article, we have covered how to book tickets online for City Palace, Udaipur with entry ticket details. We have also mentioned City Palace Udaipur Timings and Tour Guide for people visiting this place. The price / fare of these tickets are different varying from individuals with instrument costs. The Light and Sound Show tickets and Boating tickets at City Palace are sold at different counters and you can also have online ticket booking facility for the same. The Palace resides in the background of Lake Pichola, the center heart of Udaipur city attraction. There is a mix of Rajasthan architecture, towers of different sizes and a heritage building that boasts so many memories of the past rulers. The City Palace is surrounded by corridors, rooms and dining halls of Shahi Maharajas of the past. This palace is completely built of granite and marble. There are two entrance gates - Great Gate and the second called the Triple arched gate (Tripolia). Both the gates has been designed beautifully keeping the heritage of Rajput Maharajas and their traditional entry points intact. The view from the City Palace is fantastic as it resides on a hill top towards the banks of Lake Pichola. There are different areas and palaces within the City Palace which makes it, the biggest Palaces for any Rajput ruler during those days of time. The built and start of ruling within City Palace in Udaipur is credited to Maharaja Udai Singh back in 1559 year. This Palace is one of the most visited tourist place not only in Udaipur, but in the entire state of Rajasthan Tourism. A mix of Rajputana and Mughal architecture is represented along the walls of the Palace and the paintings describes the marvel of the Maharaja living culture. It is said that there are 10 to 12 different palaces within the entire City Palace premises. These are nothing but building built by different rulers under the Rajput dynasty and few successors under the Mughal era. There are so many antique paintings, furnitures during that era, vessels used to make food and many other pieces of information that makes this Palace a golden memory for Rajputana rulers. While visiting this place, one can also come across the Sheesh Mahal (Glass Palace) and Manak Mahal (Ruby Palace) that makes it even more beautiful adding the flavour of rulers of the past. The historical importance lies in the depiction of the Mewar kingdom when their territory was extended and their ruler setup the Maharana dominance later. Below are some of the attractions to be noted while visiting the City Palace, Udaipur. The compilation of these beautiful places and their tourist access is currently permitted accordingh to Rajasthan Government. 1. Amar Vilas Palace :: This palace area is a beautifully decorated green garden consist of fountains, towers and terraces. It is a garden area where the Maharajas from different princely kingdom spent some quality time discussing their extension of kingdom. The Amar Vilas leads to the Badi Mahal which was the actual Palace of the Maharajas. 2. Fateh Prakash Palace :: Initially this Palace was built by Maharaja Sajjan Singh of Udaipur to have lunch and dinner along with their Palace queens. But currently this Palace has been converted into a Hotel providing access to numerous antique crockery and furniture that were used by the rulers. It is believed that Crystal chairs, dressing tables, sofas, tables and different pieces of furniture were made in according to Queen and their loved items. These items have been less used as the ruler died soon after they were built and only Queens of the dynasty could use them as a heritage. 3. Badi Mahal :: It was the place situated on a 90 feet high natural rock foundation. Better known as a the King's palace, this area was utilized for celebration purposes among rulers of different areas. One can see different paintings on the wall during the 18th and 19th century era which showed the rulers and their leaders along with them. Badi Mahal has a significant portion of area dedicated to Maharana Udai Singh II for discussing strategies with their soldiers. 4. Entrance Gates :: The first main entrance of this Palace is through Bara Pol which is a gate having elephants carved out in the marble. It leads to the first place where Maharajas used to spend some time studying their gold and silver jewels and they also distributed some within the poor people community. After crossing this, a second gate called Tripolia is constructed which is the main gate to the actual City Palace living. This gate is the tallest gate and kept secure by the Maharajas to protect their rulers and Palace Queens from getting harmed by external people visiting them. 5. Sheesh Mahal :: It is also referred to as a Palace of Mirrors and was built by Maharana Pratap for his wife in the memory. The design depicts the architecture marvel and showcases the lights and colours of the entire Palace in a small place. 6. Mor Chowk :: This is a beautiful section of the Palace where the peacocks represents three different seasons of the year - Summer, Monsoon and Winter. These peacocks has been carved out of the coloured glass and they lead into the Palace area where lots of mirror mosaics are depicted on the wall. They also had the coloured windows in the top portions of the Palace as nobody can see through the window to check what is going inside the Palace. Below is the breakdown of information in regards to ticket booking facility provided at the entry of City Palace, Udaipur. You can also avail discounts by booking tickets online and showing them while visiting the Palace according to your own convenience. Please Note :: The discounted price is valid only for online ticket booking. Please let us know if you are interested to book them online as a part of the tour facility. We will book them online at discounted price and send you the tickets free of cost. You can comment below your name with family members and we can send you the tickets which are discounted as per the above prices. To avail more discounts, bulk bookings of 10+ members would be needed. We can check for the discount rates in that case - let us know accordingly. 5. Sunset Boat Ride for Adults above 18 years of age - Timings from 4 PM to 6 PM - Rs.700/- per head at City Palace Gate - Discounted online ticket booking price at Rs.600/- per head. If you are visiting for the first time, it is always good to have an official guide from the City Palace as they make you visit the entire Palace explaining each and every aspect of the Maharaja's life and living. An official charge of English speaking guide - Rs.350/- per head. Please let us know in comment section if you are interested for the discounted tickets or not and if planning for Udaipur - We can provide you the best prices for City Palace Entrance Tickets at your convenience free of cost.